With this damp, humid morning, one might confuse today’s weather with the tropics. With that said, the beauty of the plant world has never-ending places to discover the unusual. So when things surface like a great resource, sharing it with other passionate gardeners is a given. Although I must admit this is an area I lack green-thumb luck, tropical plants are fascinating. When a horticultural friend shared his catalog for this longstanding tropical grower, Logees, a family-owned business since 1892, it certainly heightened our interest. On the surface, the catalog looks standard for the industry. Once you dig into the unusual varieties and selection, this grower is a must for any plant enthusiast. If you want to see it first-hand, schedule a trip to their greenhouses. It’s already on our fall to-do list as we heard through the grape vine you don’t want to miss this adventure. So check out this hot-spot in Danielson, CT and if it isn’t in the stars, at least plan a trip to the tropics by taking a virtual visit to their website http://logees.com/. The inspirational thought for the day is by Hal Chadwicke. “A vacation is a sunburn at premium prices.” So book your trip to Logees and spare yourself the tropical sunburn. The money you save can be spent on a few plant treasures for your home this coming winter. 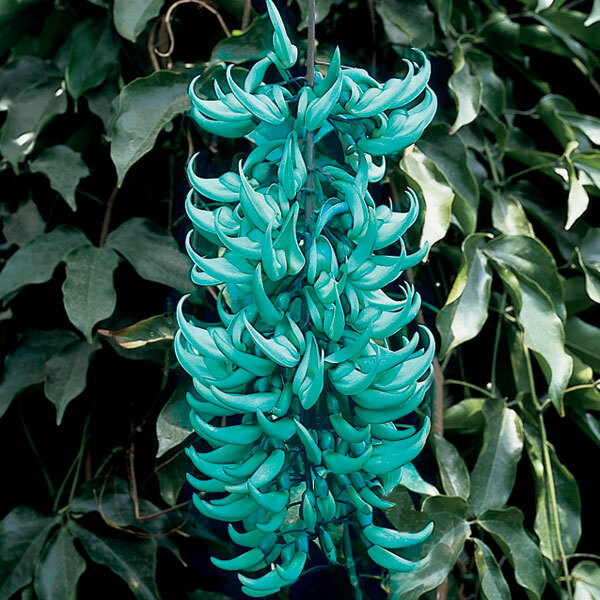 Above image of Strongylodon macrobotrys 'Jade Vine' is from Logee's Website. If I can dig through our photo archive, I'll post Greg's image of the Jade Vine from our last visit to Hawaii.